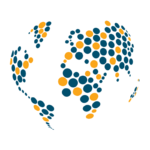 While most of the political violence in Myanmar arises from the conflicts between the Myanmar military and the many ethnic armed organizations (EAOs) in the country, inter-ethnic conflict has increased in recent years. One such conflict is that between the Palaung State Liberation Front/Ta’ang National Liberation Army (PSLF/TNLA) and the Restoration Council of Shan State/Shan State Army-South (RCSS/SSA-S). In the months after the Nationwide Ceasefire Agreement (NCA) was signed in late 2015, fighting between the RCSS/SSA-S (a signatory to the NCA) and the PSLF/TNLA (a non-signatory) flared due to territorial disputes between the two groups (see Figure 1). Given the many ethnic groups in Myanmar, the territorial demands of smaller ethnic groups such as the Palaung/Ta’ang within Shan state complicate negotiations to establish a peaceful, federal union. Under the 2008 constitution, the Palaung Self-Administered Zone was established, consisting of Namhsan and Manton townships in northern Shan state. It is one of five self-administered zones and divisions in Shan state. With the support of the Kachin Independence Organization/Kachin Independence Army (KIO/KIA), the PSLF/TNLA, comprised of ethnic Palaung/Ta’ang, has been able to grow its army. In expanding its reach, the PSLF/TNLA has argued for two additional townships — Namhkam and Kyaukme — to be part of the Palaung Self-Administered Zone. An ally of the PSLF/TNLA, the United Wa State Army (UWSA), has proposed awarding self-administered states, divisions, and zones based on an ethnic group’s population (Euro-Burma Office, September 2016). The Myanmar military has rejected this proposal. 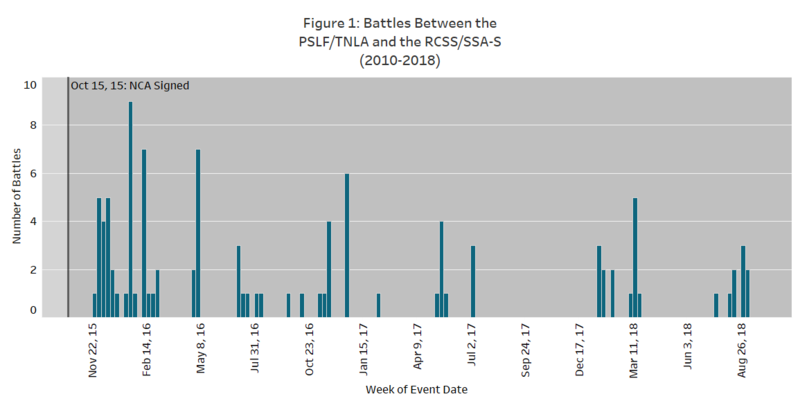 After signing the NCA in late 2015, the RCSS/SSA-S increased its presence in northern Shan state, which led to clashes between the PSLF/TNLA and the RCSS/SSA-S. The RCSS/SSA-S, which had been primarily based in southern and eastern Shan state, has claimed that all Shan-inhabited areas are legitimate areas of operation (Asia Times, 16 August 2018). The PSLF/TNLA views this movement northwards as trespassing and has claimed that the RCSS/SSA-S and the Myanmar military have collaborated to fight the PSLF/TNLA (Radio Free Asia, 01 December 2015). Yet, despite signing the NCA, the RCSS/SSA-S itself still occasionally clashes with the Myanmar military (The Irrawaddy, 12 September 2018). In addition to clashes, both the RCSS/SSA-S and the PSLF/TNLA have traded accusations against one another regarding the abuse of civilians (The Irrawaddy, 05 September 2018). The PSLF/TNLA’s arrest in August of an ethnic Shan woman, for example, has resulted in significant protests in Namhkam township (The Irrawaddy, 17 September 2018). Since July 2018, the PSLF/TNLA has joined with the Shan State Progress Party/Shan State Army-North (SSPP/SSA-N) to fight the RCSS/SSA-S. The bilateral military alliance that has emerged between the PSLF/TNLA and SSPP/SSA-N has been reinforced by their membership in the Federal Political Negotiation and Consultative Committee (FPNCC). 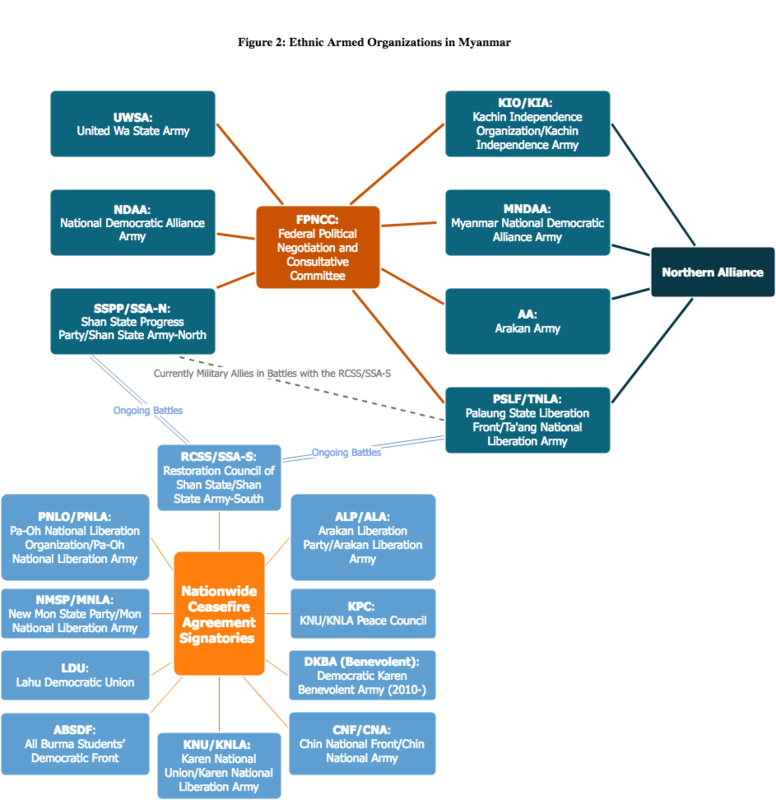 The FPNCC is an alliance of seven EAOs — including the Northern Alliance (a military alliance of four EAOs led by the KIO/KIA; for more on the Northern Alliance, see this recent ACLED piece) — that have yet to sign the NCA (see Figure 2). Led by the UWSA, the EAOs of the FPNCC have strengthened their respective positions in peace negotiations with the government and military through their involvement in the alliance (United States Institute of Peace, 14 September 2018). In 2018, much of the fighting between the RCSS/SSA-S and the PSLF/TNLA has happened in and around Namtu township, a region rich in natural resources. Namtu is home to the historic Bawdwin mine, once a world supplier of lead, silver, and zinc. An Australian mining company has recently invested in developing the mine (Frontier Myanmar, 31 January 2018). The Yeywa Dam on the Namtu river — a project backed by Chinese, German, Swiss, and Japanese companies — has likewise caused tension in villages down the river from Namtu township in Kyaukme district (Shan Herald Agency for News, 12 September 2018). Further, Namtu is situated along the Shwe Gas and Oil Pipeline route. A joint venture between the China National Petroleum Corporation (CNPC) and the military-linked Myanmar Oil and Gas Enterprise (MOGE), the pipeline route has been the cause of increased militarization in the region (The Irrawaddy, 07 November 2012). 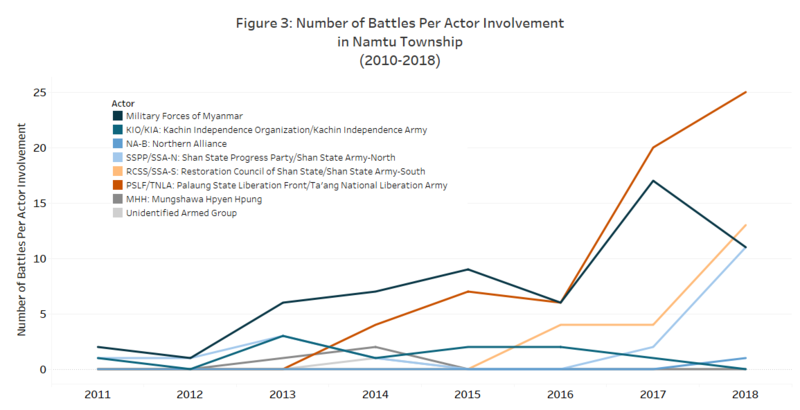 In addition to the conflict between the RCSS/SSA-S and the PSLF/TNLA, Namtu township has also been the site of fighting between the Myanmar military and several EAOs (see Figure 3). Given the natural wealth of the region, and the involvement of international actors in Namtu and the surrounding areas, the desire of armed actors in northern Shan state to control the region is likely to lead to more conflict in the future and further displacement of villagers (The Myanmar Times, 05 September 2018). Thus, clashes between the PSLF/TNLA and the RCSS/SSA-S are likely to continue with Namtu township being a key locus of conflict.